No longer can design just be an outsourced add on, limited to putting lipstick on a pig. The Designer Fund understands that as the tech space becomes more saturated, design is a key differentiation point. Through a non-profit book project, it hopes “to demystify the path for designers to build tech startups with meaningful impact and for entrepreneurs to embody design thinking in their work.” The book, Designer Founders, will share stories from today’s most successful design entrepreneurs including Khoi Vinh (Mixel), Brian Chesky (AirBnb), and Scott Belsky (Behance). The book will be free for students—an effort that the authors say will help fill a void in traditional design curricula. Today is the last day to support the Designer Founders publishing project through Kickstarter. 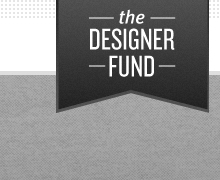 We wish the best to our like-minded friends at The Designer Fund and can’t wait to get a hold of a copy of the book. Be sure to check out previews of their interviews here.